Plane Curves: Local Properties. Plane Curves: Global Properties. Curves in Space: Local Properties. Curves in Space: Global Properties. Regular Surfaces. The First and Second Fundamental Forms . The Fundamental Equations of Surfaces. Curves on Surfaces. 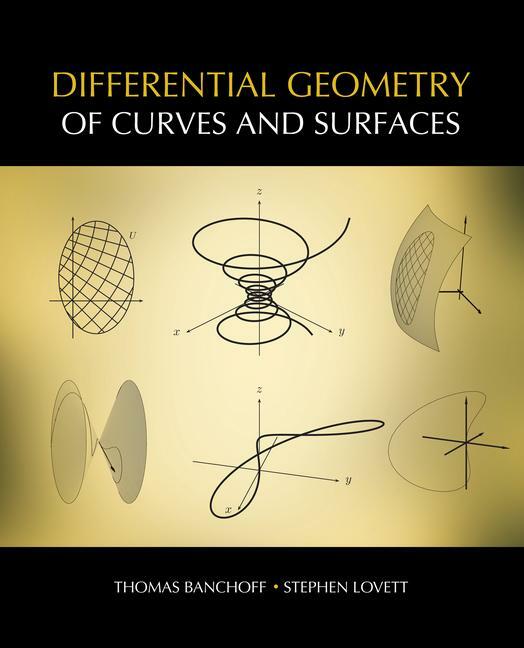 Thomas F. Banchoff is a geometer and has been a professor at Brown University since 1967. Banchoff was president of the MAA from 1999-2000. He is published widely and known to a broad audience as editor and commentator on Abbotts Flatland. He has been the recipient of such awards as the MAA National Award for Distinguished College or University Teaching of Mathematics and most recently the 2007 Teaching with Technology Award. Stephen Lovett is an associate professor of mathematics at Wheaton College in Illinois. Lovett has also taught at Eastern Nazarene College and has taught introductory courses on differential geometry for many years. Lovett has traveled extensively and has given many talks over the past several years on differential and algebraic geometry, as well as cryptography.